Congratulations! You win 60 bonus points with this purchase! 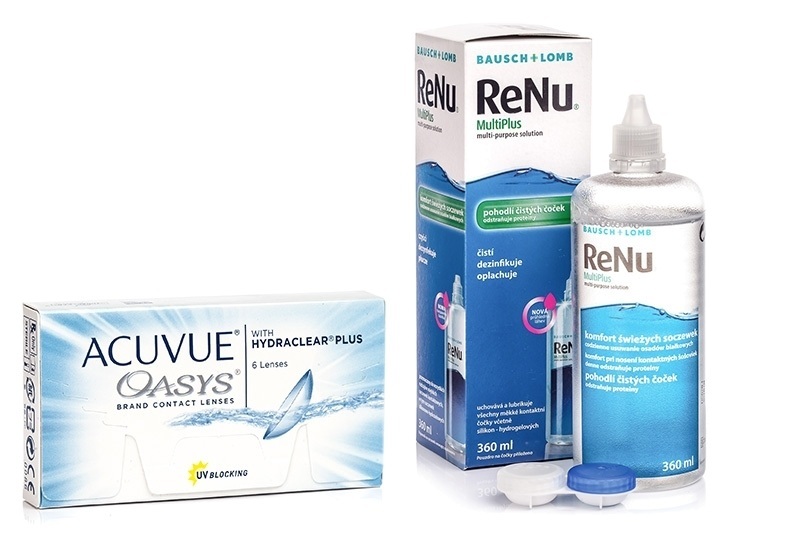 We offer an economy pack for fortnightly contact lenses Acuvue Oasys (6 lenses) with ReNu MultiPlus 360 ml solution. Acuvue Oasys from Johnson & Johnson are two-week contact lenses for daily use. These silicone-hydrogel contact lenses were created for very sensitive eyes – their exceptional breathability provides 98% of available oxygen to the open eye, while HYDRACLEAR Plus keeps them moist at all times. Talk to your optician about changing Acuvue Oasys lenses weekly. ReNu MultiPlus from Bausch & Lomb is a multi-purpose solution for the complete care of all types of soft contact lenses. This versatile solution rinses, disinfects and moisturises lenses, and removes proteins and lipids contained in tears. It includes pH balancing boric acid and poloxamine, which removes the outer remnants of cellular tissues.